In order to have a functional online presence for real estate dealers, a Real estate portal is must. Here you can feature your properties with complete details. It is an open source platform for both sellers and buyers. 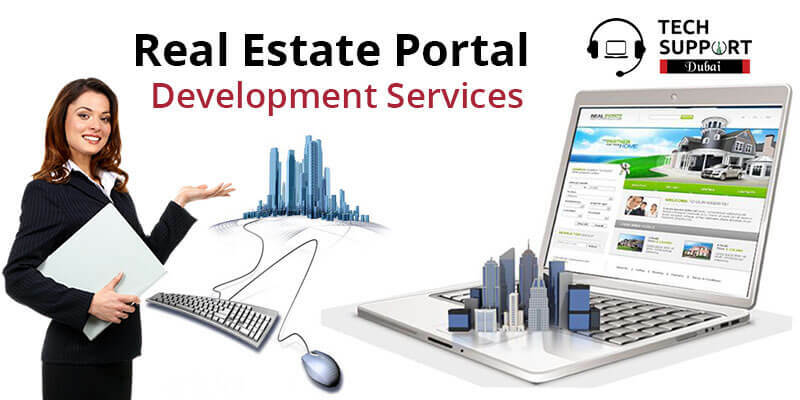 Real Estate portal development helps to create a flexible and user-friendly web portal for your Real Estate business. It is regarded as the most complete and prominent web based marketing tool. If you are unable to design a proper portal for your Real Estate business, contact the experts at TechSupportDubai. We strive to give your portal an edge in the online marketplace. Our experts help sellers, buyers and agents to launch professional and powerful property portal by integrating every feature and custom function. We offer the best Real Estate portal development services in Dubai. Why choose Real Estate portal for your business? We stand out from the competition with a professionally designed real estate portal. Our proficient portal developers make user friendly real estate websites that fulfills all your business requirements. We work miles apart to give you a solid online presence. We built real estate websites that load quickly with HD images and quick to read information. It also allows you to exchange properties with other agencies as well. Our primary focus is to make your agency grow into new markets and existing ones. If you are searching for a Real Estate portal development company in Dubai, Tech Support Dubai is your ideal choice. Our experts are available throughout the day to assist you. Searching for an affordable Real Estate portal development in Dubai? Haven’t found one? Don’t stress, rather dial our helpline number +971-43873431. Interact with developers and discuss your business. Based on your business objectives, we design portals which are a masterpiece. Along with designing portals, we also offer services which are required to maintain your portal. Do not delay in reaching us as our team is always at your rescue. In case you are too busy to talk, drop us an email enlisting your worries. We are also available through live-chat window. We also provide Healthcare portal development service in Dubai.